There are many unspoken rules every man must know when it comes to attaining a proper Tailor Made Suit. 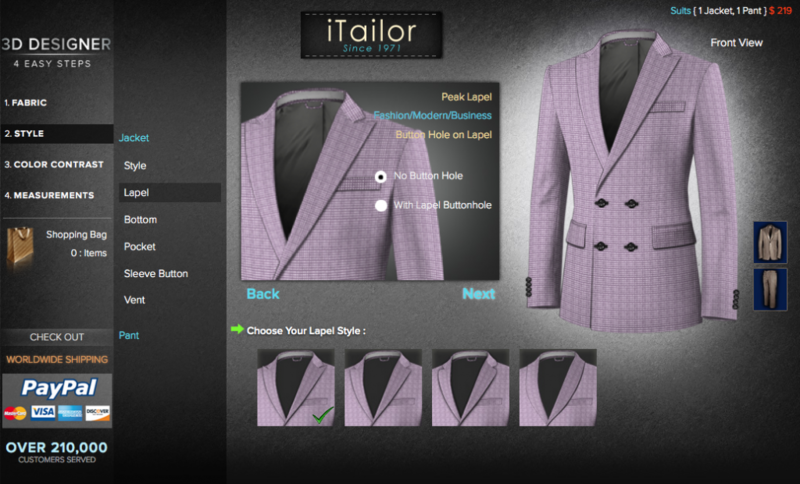 iTailor.com – The World’s Leading Online Tailor, with over 4 Decades, Spanning 3 Generations in the Tailoring industry, proudly presents the 15 Suit Style Tips Every Man Must Know. Whether you’re the type to sport a suit every day or wear one occasionally for events from time to time, it’s not enough to simply buy off the rack and have length hemmed to “fit you”. If you’ve ever seen David Gandy or David Beckham in a suit you know the last time you wore a suit it probably didn’t look that tailored on you. The word tailored or tailor-made, carries with it a certain perception of class and a high price-tag. And although this hold true traditionally, owing to the laborious craftsmanship involved in creating a masterpiece exclusively for you, we at iTailor.com have seamlessly combined I.T. and Art to revolutionize the Fashion Industry as Highlighted in the Video Below! 15 Suit Style Tips Every Man Must Know about Tailor Made Suit! Some style tips are a bit more subtle and others more mainstream, some you can easily find in our Design Options for Tailor Made Suit. However, putting them all to good use is what will surface the results you’re looking for. So grab a sheet of paper or bookmark the link for this article, you won’t want to lose our suit style tips! If you’re the type of guy who lives a lifestyle where you only need one tailor made suit, make it a CHARCOAL COLORED SUIT. Some say this is even more proper for funerals than a black suit, but either way it’s a very versatile color and can be worn to a multitude of events for different occasions. When it comes to tailor made suit Styles, one of the most important things to know and learn about is your Lapels. Know the different styles – Peak, Notch, Shawl – know what you like, what works for the suit your purchasing, and how they align with the collar style your shirt has and the size/width of your tie. As a rule of thumb, you can never go wrong with a Single-Breasted Two Button Notch Lapel Suit. For Double-Breasted Suits, opt for the Peak Lapel. More on Lapels: Today’s Fashion are leaning towards thinner lapels – you are able to easily customize your lapel width by contacting our Customer Service representative at contact@itailor.com. *Request a Top-Stitch – Our newest Complimentary Feature that allows you to feel like a million bucks with a Saville Row Swag! The Tie. You can never go wrong with Tie Colors, so Show-Off your favorite color. It is also a good idea to have the basic, Black, Grey, Red, Blue in stock! Your Tie should hang right at the belt line. Not above it or below it. 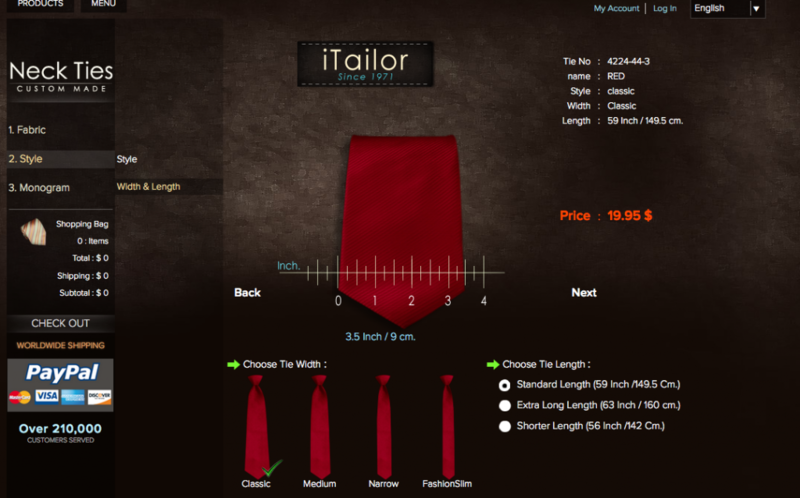 You are able to customize and order ties here! Get Your Custom-Tie (Monogrammed and Trimmed)! The Pant Problem: Buying off-the-rack Pants may leave you short-changed – literally, as some pants may fit your waist but are too short in length or vice versa; too long requiring hemming. A decent pair of tailored pants, that covers your socks while seated is a must for any respectable gent – even if paired casually with a Polo T-Shirt or Dress Shirt. 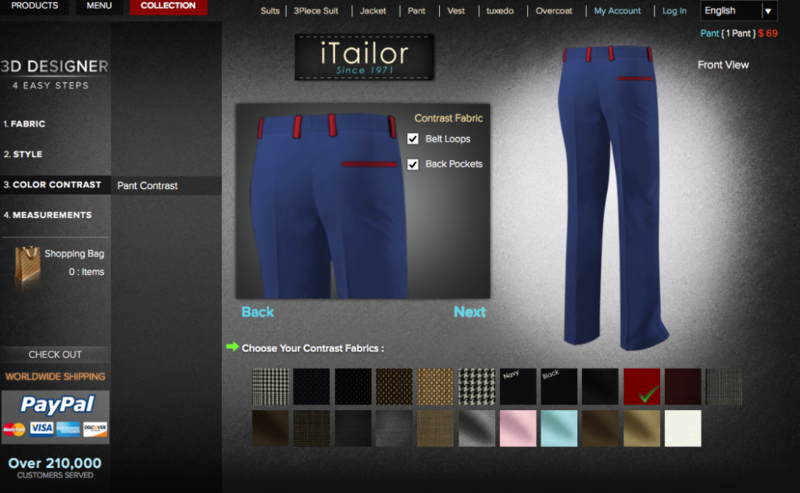 With our Custom-Pants Designer you are able to get your Pants Made-To-Measure! Patterned Suits. iTailor.com offers you the largest collection of fabrics online, which includes some of the most varied range of Patterned or Striped fabric ranges. Patterned Suits are great for semi-formal occasions, and look distinguished when designed as a double-breasted piece. Pair the Double Breasted Jacket, with a solid color Pants to complete the laissez-faire look! Double Breasted Suit Styles can get tricky, but you want to always remember two things; never wear the jacket unbuttoned, and when you’re wearing a 6 button (2 functional button) jacket, only button the top functional button. 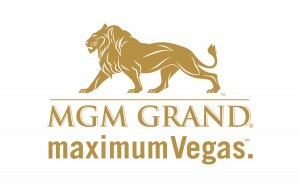 Know whether your jacket is a No vent, Single vent or Double vent, know what you prefer and know why. No Vent and Single Vent will have maintain the shape of the jacket, at the expense of mobility – it is recommended for Thinner torsos. Double Vents on the other hand allows for increased mobility, and recommended for Big and Tall individuals. 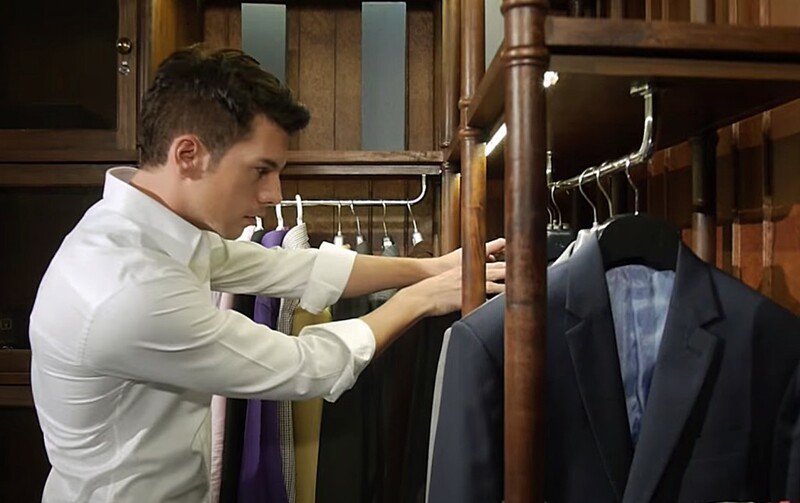 Your Shirt Cuffs should always show about 1/4 to 1/2 past the length of your jacket cuff. 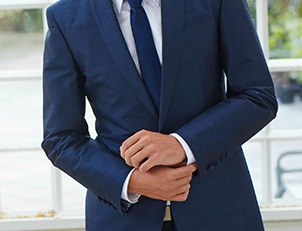 The Modern Suit is acceptably worn as an open-collar. Therefore, when wearing a Suit without a Tie, the shirt-collar must be on point! 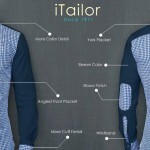 iTailor shirts offers you unlimited designing options when it comes to shirt collars and contrasts – with complimentary collar slots for collar stays even. We recommend our signature Italian Collar as the smartest collar style to be worn as an open-collar attire sans tie. Whether you you’re sitting, standing, or walking your pants should always be comfortable to you. You should also always be able to fit one finger in your waistband. With single breasted suit style you want to make sure that you only ever button the top button of a 2 button suit, and the middle button on a 3 button suit. For even more information we suggest taking a look at GQ’s Guide To Suits as they go into great detail regarding men’s suit style. We hope you have enjoyed our section on suit styles, why not test one out for yourself now from the World’s Leading Tailoring Company. doo so! Your writing style has been surprised me. Thanbk you, very great post. The styling tips highlighted about tailored suits in your blog are truely great. The visuals make it more easy to understand how exactly it needs to be done. Kudos to your work. Amazing details. I would love to read more about tailored and made to measure suits. Thank you Anika, for your great feedback!